The Cardiac Science Powerheart/FirstSave Training Unit is a Dual Mode AED Trainer with wireless infrared remote control for teaching both Semi-Automatic or Fully-Automatic defibrillation. This training unit is pre-programmed with all American Heart Association recommended training protocols for a Sudden Cardiac Arrest rescue. 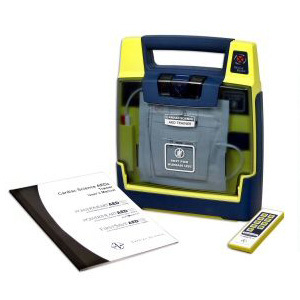 Package includes: Cardiac Science Full-Size AED Trainer Training Electrode Pads, Remote Control and User's Manual . A must have for CPR instructors and trainers doing AED training.